The battery revolution continues to evolve, with several manufacturers looking for ways to create cleaner, more efficient and faster charging fuel alternatives. Which brings us to First Graphite (ASX: FGR), a graphene technology company sourcing premium quality graphite from Sri Lanka, and transforming it into graphene. But that’s no longer all it does. Whilst progress continues with its graphite mines, and its graphene processing and development work, FGR has now jumped on an opportunity to commercialise supercapacitor technology that it could not pass up. FGR is set to earn a controlling interest in a private company working with Swinburne University to advance a radical new energy storage device – a graphene-oxide based supercapacitor, known as the Bolt Electricity Storage Technology Battery, or BEST Battery for short. While its sounds like something out of a Back to the Future movie – remember the flux capacitor that powered Doc Brown’s DeLorean – the supercapacitor is real and a current proof-of-concept device, which physically stores energy rather than chemically, and has already performed better than existing batteries. It’s even been dubbed a ‘miracle supercapacitor’ and identified as a very attractive component to be used in smart phones, portable devices and electric vehicles. The patent pending technology developed by Swinburne University overcomes energy density limitations and has several advantages. These include being ultra-thin and ultra-light, providing ten times better energy density and ten times faster charge/discharge rates than competing devices, and is capable of 10,000 charge/discharge cycles. It is also highly flexible and integratable, while being environmentally friendly thanks to the absence of chemicals used in the technology. FGR will provide $2 million over the next 18-24 months in exchange for a 60% controlling interest in the company that holds the international licence to this technology. The move plays nicely into FGR’s overall plans as it is now consistently producing high quality, low cost graphene that it can use towards its technology ambitions. Remember, however, that FGR is an early stage company and investment success is no guarantee. Apply caution to your investment decision with regard to this stock. The addition of the supercapacitor will run in parallel with these ambitions, and provide the company with an exceptional technological synergy. FGR is very much focussed on the growing graphene technology sector. It will enter the market without the need to finance or build a processing plant. That means there are no intimidating expenses here, which means less time to production, and a lower risk of dilution from large capital raises required to build a mine. It also allows the company to enter production without a big offtake agreement, typical of conventional graphite explorers. The company is currently producing some of the highest quality graphene in the world at the lowest cost. It has gained the interest of automotive companies, aircraft manufacturers, paint manufacturers and many other companies in other industries, as it expects to hit up its first graphene sales. The commercialisation process has well and truly begun for this minerals explorer turned tech company and its foray into supercapacitor battery technology is icing on its graphene cake. Aside from its graphene production and battery technology components, First Graphite (ASX:FGR; ETR: M11) has graphite-rich 395km 2 (39,500 ha) of ground spread across 13 prospects within several provinces of Sri Lanka, home to the highest grade, naturally occurring, crystalline graphite in the world. FGR’s samples and assays have numerous times recorded grades of 95%-99% TGC. The image above is 20-25kg of Sri Lankan vein graphite with a grade >95%. To put this into context, 20-25kg of flake graphite at 10% TGC would be surrounded by 200kg of host rock – which means it’s much more expensive to dig out of the ground. ...and you in your living room, if you’re into that sort of thing. So as you can see, FGR’s innovative approach to producing graphene puts it more in the tech boat than the mining and exploration space. A machine the size of a premium-priced kitchen appliance plugs into a power outlet. 2. Around 250kg of virtually untouched and unprocessed high-grade graphite is loaded in. 3. The machine goes to work creating a range of graphene compounds that can be used in many manufacturing applications. Here at The Next Mining Boom , we think FGR’s mobile graphene factory is an Aladdin’s Lamp for Manufacturing processes the world over. In time, FGR plans to improve its prototype and enable even more customisation, flexibility and expand the range of outputted compounds. Pretty much any manufacturer that produces consumer goods would absolutely love to incorporate such features into their products – and the race is already on to develop the most commercially-astute method of turning graphene into dollars. With all that in mind, let’s run through FGR’s potential and realistic chances of upgrading its position in the graphite and graphene stakes. The first of hopefully many 20 tonne containers of high-grade graphite was shipped from Sri Lanka last August. 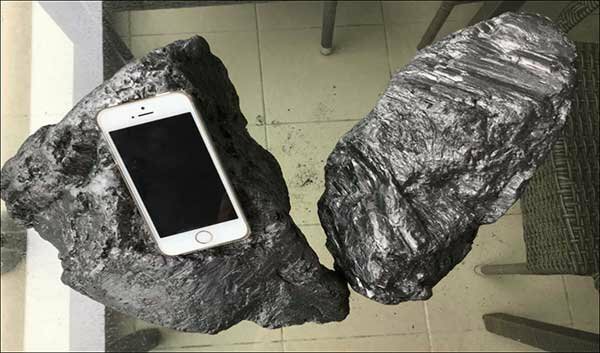 This first batch was for FGR to hone its graphite-processing-graphene-manufacturing process and build stockpiles of high-TGC graphite to sell to raw material buyers – not just to put into its Graphene Cell. Given that it takes a while to get a mine up and running, FGR has adopted a dual strategy of acquiring and marketing third party graphite. To ensure that FGR has sufficient graphite to continue its technological developments, on January 13, 2017 the company announced it signed a Sales Agreement for 24 months with a Sri Lankan government owned supplier from which it will purchase premium quality graphite. FGR must have been very pleased to get the deal locked away as an exclusive partner as there have been a number of other parties seeking such an agreement in recent times yet unable to secure one. 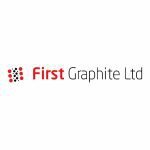 The agreement will ensure that there is a good supply of graphite through the commissioning and ramp up period without any interruption to the graphene initiative, FGR’s primary source of growth going forward. FGR also plans to accelerate the availability of graphene that can be supplied to potential customers, given the rapid progress with the commissioning of the graphene cell. 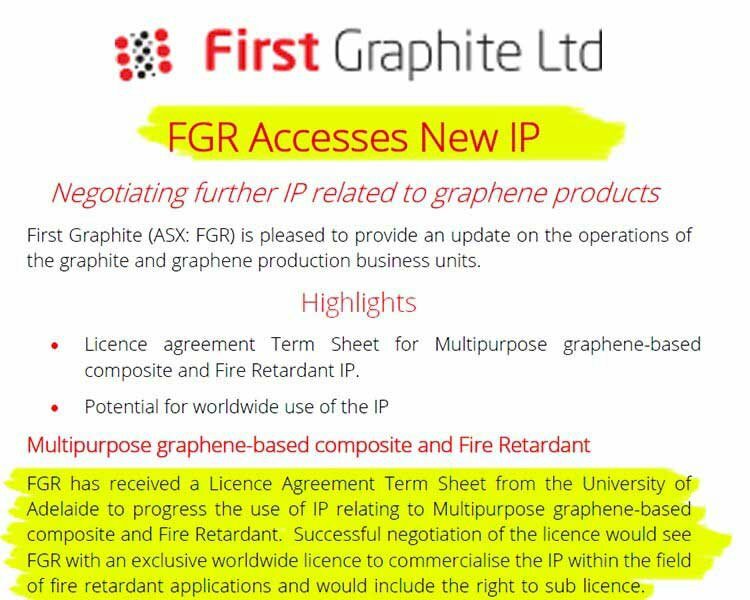 In other words, FGR wants to get to the business end of graphite/graphene commercialisation right from the word Go. The 250-litre graphene cell developed and built by FGR has been successfully commissioned and has surpassed all operational expectations so far. The response was very positive, and FGR has been inundated with requests for samples and various other offers of collaboration. Could there be some additional IP-related catalysts around the corner for this tech-savvy miner? In September, FGR demonstrated its capacity to continuously produce significant amounts of high-quality graphene. A finished product with purity as high as 96% has been repeatedly achieved and FGR now hopes to fast-track its technology into the commercial marketplace by raising the scale of its abilities. 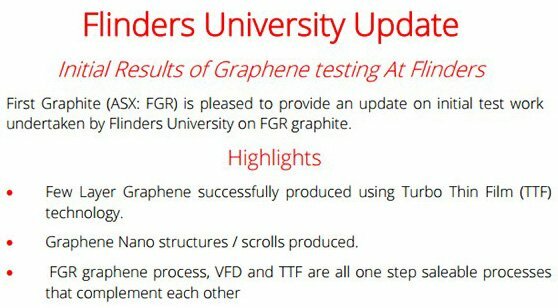 Once manufacturers get word that they can source high-quality graphene from their very own workshops and laboratories, we think it’s only a matter of time until FGR’s till is ringing. With monetisation on the horizon, FGR is now conducting further research into developing the optimum mix of power and electrolyte and undertaking development work on improving screening, washing, drying of the finished graphene product(s). This R&D will help with reducing the input costs, and improving output quality once FGR’s graphene goes into mass production. FGR’s premium-quality graphite is earmarked for both conversion to graphene and for use in accelerating the establishment of FGR’s emergent position as a credible supplier to the premium graphite market. Not only could FGR supply graphite to the market, it could also play a major role in providing new battery technology after entering into a binding Heads of Agreement with Kremford Pty Ltd, which gives FGR with the opportunity to own a controlling interest in the private company. Kremford is currently working with the Swinburne University of Technology to advance a new energy storage technology, the Bolt Electricity Storage Technology Battery, aptly known as BEST Battery. The BEST Battery is a graphene oxide based supercapacitor offering high performance and low cost energy storage. 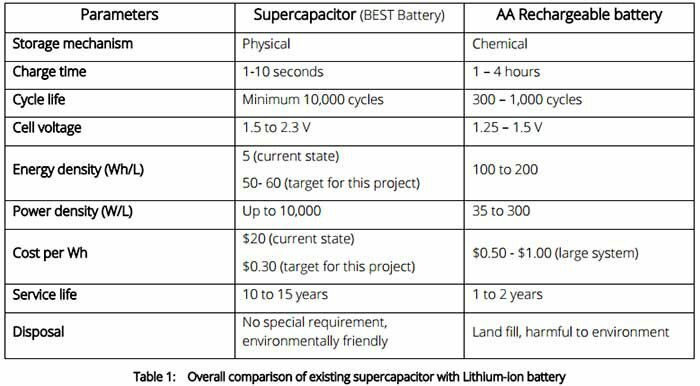 The patent pending technology has a number of advantages over existing supercapacitors which have energy density limitations and offers advantages that come with physical storage of energy as opposed to chemical storage. The ultra-thin and ultra-light battery provides ten times better energy density and ten times faster charge/ discharge rates than competing devices, and is capable of 10,000 charge/discharge cycles. The technology will also provide better efficiencies through the use of laser printing technology and graphene oxide to create an ultra-efficient energy storage medium in a greatly simplified process. The current proof-of-concept device has performed slightly higher than current batteries but FGR and the University believe that with additional product development and up-scaling the BEST Battery can be taken from a laboratory success to a commercial prototype within the period of the Agreement. FGR is to underwrite the spending of $2M over a two year period to earn a 60% interest in the company that holds the technology’s international licence. It involves two stages of commitment. The first is an initial $700,000 commitment from FGR to earn a 30% stake in Kremford. The second stage involves the option for FGR to increase its equity to 60% by committing a further $1.3 million within two years of the Research and Licence Agreements being signed. The agreement involved a few other share issuances and options, as detailed in the announcement . There was also talk that FGR should be able to increase its interest in Kremford to 100% at some point in the future. FGR has established several R&D relationships with research laboratories specialising in graphene processing in order to be at the forefront of graphene-industry developments. Currently, FGR is working on two specific areas: the use of sonication screens and the use of a Vortex Fluidic Device (VFD) and Turbo Thin Film processing technology. In addition, FGR is also on the lookout for new Intellectual Property (IP) to add-in to its repertoire and raise its operational capabilities, without breaking the bank. What about mining – isn’t that what graphite explorers are supposed to do? Whereas any ordinary graphite ‘explorer’ is focused on drill holes, assays and measured resources, FGR is pursuing a technology-enabled alternative. However, that doesn’t mean FGR’s drill bits aren’t moving. FGR’s Aluketiya Project has had electromagnetic surveys completed and continuing work on generating larger amounts of ore – but this isn’t necessarily required. Aluketiya is located in Meegahatenna within the Walallawita District, approximately 85km from Colombo. Meegahatenna is considered to be one of the richest graphite-bearing areas in Sri Lanka. Graphite production was halted in the 1960s, with the first available opportunity to return to production now completely in FGR’s hands. FGR’s project area has never been subjected to modern exploration techniques, which tend to improve all aspects of mining including speed, cost, grade and life of mine. Previous diamond drilling at Aluketiya has returned grades as high as 99.3% graphite. That’s pretty much pure unadulterated graphite straight out of the ground, which can then be stockpiled, processed, sold on or in FGR’s case – be transformed into premium-priced, high margin graphene products. The company recently divulged that the development of its 100%-own graphite mines in Sri Lanka has been more challenging than anticipated, mostly due to ground conditions in the initial excavation of the shafts. There is more work to be done on the mine shafts down below – but the critical factor is that FGR’s future is not dependent on its exploration success. 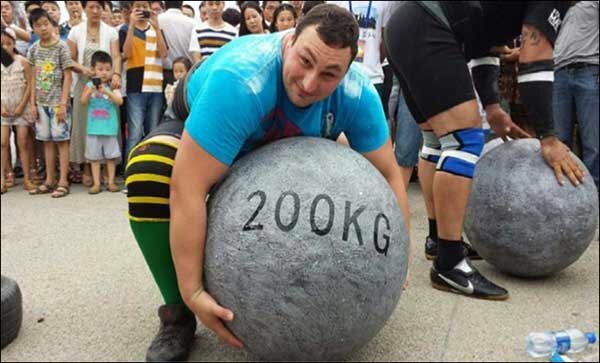 But with supply locked in for the coming 24 months with a Sri Lankan Government owned supplier, the recent the pressure on FGR to produce high-grade graphite ore from its own mines has eased. FGR can now focus on its prime focus the Graphite Cell, rather than a huge JORC Resource that would require a hefty offtake agreement before revenues are generated. Contrarily, FGR is on the verge of shifting some of its Graphite Cell machines which is what it hopes will generate the commercial edge, as opposed to a larger or higher grade JORC Resource. 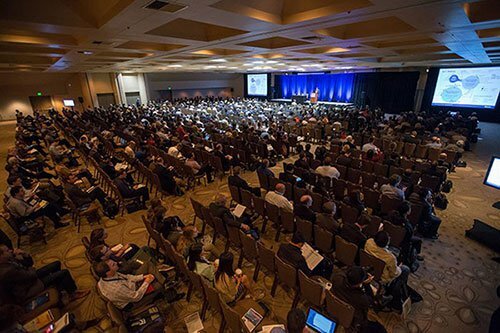 Its future is dependent on its unique strategic positioning as a tech-savvy graphene processor with institutional clout. 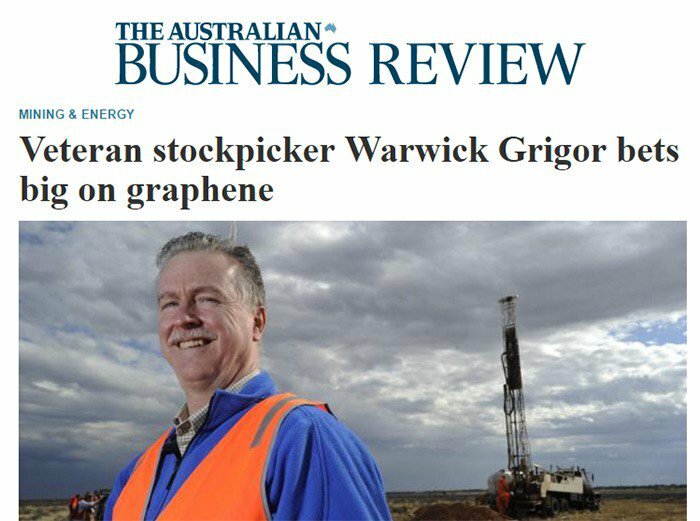 One aspect of FGR’s market strategy that we think adds supreme confidence is its cornerstone investor, and mining-sector veteran, Warwick Grigor. Mr. Grigor has over 20 years’ experience in mining, commodities and backing the right horse when it comes to early-stage mining companies. With veteran stock-pickers piling into FGR, it may just be a good idea to tap into the same trough before the investment banking hogs show up to appropriate all the spoils. In his first address to FGR shareholders as Chairman , Mr. Grigor laid out his vision of where FGR is headed, and how it will get there. As we pointed out earlier, this AU$35 million-capped ‘explorer’ is more akin to a Technology company, rather than a Miner. The past 12-18 months have seen FGR advance its exploration activity, build its first prototype and raise $7.4 million from shareholders to advance its graphene-conjuring masterplan – and yet, this is only the beginning. The thing that could be most positive for shareholders is that FGR is not trying to stomp the same path to production as other graphite/graphene development companies. By focusing on the processing, and not the mining, FGR represents a lower-risk entry into the graphite industry. It doesn’t require large capital expenditure and large debt financing that can often cripple early-stage companies. Shareholder dilution, repeated capital raises and the desperate need for binding offtake agreements are all issues FGR can largely avoid . 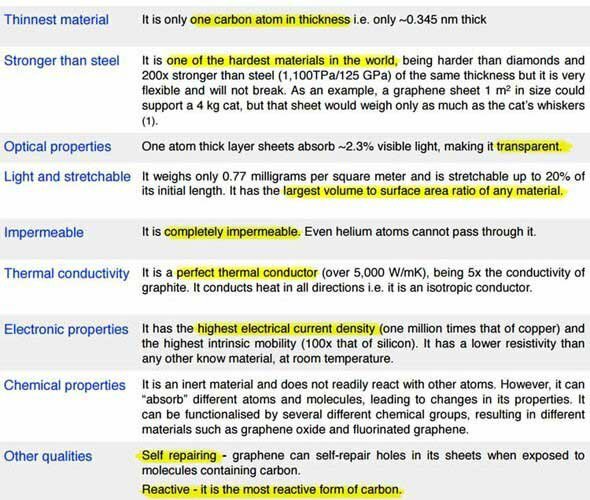 FGR’s Graphene Cell is the real value driver here, and can be adequately monetised regardless of base graphite prices. If anything, lower graphite prices would make its Graphene Cell machine even more affordable for end-users through lower input costs. However, this technology is an early stage technology and anything can happen in its move to commercial reality. Investors should therefore take a cautious approach to their investment decision in this stock, taking into account all information with regard to the company. Eighteen months ago, FGR was just starting out in the graphene business. Over that period, it has proved that it can produce the best quality graphene in the world, in bulk volumes and at low cost and it may also have its hands on the BEST Battery... literally. There is a huge difference between producing graphene as a proof-of-concept, and producing in bulk quantities to suit industrial demand. And herein lies FGR’s competitive advantage (and the commercial edge) that will likely take this graphite steed past the post before its rival peers – FGR is in the enviable position of being able to hit ‘Go’ on its commercial ambitions without funding, or supply/demand anxiety which its competitors are going through. Despite its small-cap size, FGR could realistically expect to become a price-setter in the graphene space given its low-cost (and strategic) advantage that encompasses the entire supply value chain. Its proprietary technology can also be licensed on a franchisee model or alternatively, charge recurring fees on a subscription model. The options are numerous and the potential endless because of the huge shift towards graphite, efficient energy storage and a graphene-powered world we’ve seen and heard about in Hollywood movies. ...and FGR has the whole kit and caboodle to take this embryonic industry directly into mature monetisation territory.